For the full range of maps of Durris, see National Library's Maps. 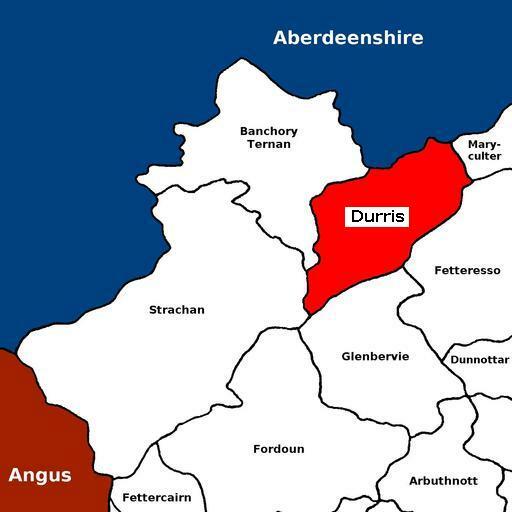 Geograph.org: Durris- Recent photographs of Durris. National Grid ref. NO7796. Located at National Grid ref. NO772965. Built in 1822. Alexander Youngson 1595-1630 M.A. ; min. of Aboyne 1593; tr. to Skene 1599; pres. to parsonage and vicarage here 1 Dec 1595; removed here 1601; still min. 5 Oct 1630; mar. Elspeth, dau. of John Reid, min. of Banchory-Ternan; issue: Alexr; John; James; Andrew, prof. of Philosophy, Abd; Wm; Robert; another son? John Hendry ?-1871-1883 b. ca. 1814 Fettercairn; d. 12 Aug 1883 Durris; mar. Jeanie Johnston; issue: Jessie E.; John R.; Roberta M.
James Alexander Russell ?-1922 b. ca. 1854 Edinburgh; min. Newhills ABD Free Kirk in 1881; min. of Causewayend U.F. Ch., Aberdeen in 1901; d. 21 Feb 1922 Durris; mar. Charlotte ---; issue: Alexr; Robt F.; Cath. ; James A.
Sheila M. Spiers - The Kirkyard of Durris (Aberdeen: Aberdeen & NE Scotland FHS, 1996: ISBN 0-947659-24-2). The Aberdeen & North-East Scotland FHS has an online search facility for names of people on the monuments they have recorded. Their list of publications is here. Andrew Jervise recorded some monuments at Durris in his "Epitaphs & Inscriptions", vol. 1, pp. 104-6. Burial records for Durris are held by the Registrar in Banchory. See Kincardine and Mearns Burial Grounds. There are no surviving records of the Parochial Board or Parish Council. Durris was in the Commissariot of St Andrews.